Everyone remembers what they were doing 5 years ago today. First came the feelings of disbelief while watching the images on TV. Then being glued to those same television sets for weeks afterwards, finally becoming too numb to watch anymore. Plenty of people have their opinion on the state of the world today because of what happened (from the war in Iraq to getting to the airport early because you can't carry on bags anymore) - thus I won't bore you with mine. There is plenty of media coverage on this topic for anyone interested. The 2 songs for today were released just prior to the events of 9/11. The films they hail from aren't all that memorable but the songs remain favorites of mine to this day. Just reminders (at least for me) of life in simpler days. The 1st selection is Kismat Se Tum, an absolutely incredible song from the movie Pukar. It was (and still is) the only Bollywood song filmed on an Alaskan glacier. Madhuri Dixit has said that it was one of the most difficult shoots of her life - see her lips actually turn the colour of her chiffon blue sari here. 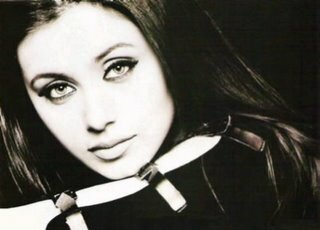 The 2nd selection is Chalo Chale Mitwa, a sweet duet from the movie Nayak - it's safe to say Rani Mukherjee wasn't nearly as uncomfortable during the filming.